Thatgamecompany suggests fans import the game or demand localization from Sony. According to a tweet from thatgamecompany, Journey: Collector's Edition, which includes a short documentary and commentary for each the company's three games, has no European release date. Thatgamecompany further listed Japan and Australia as countries that would not see the bundle. While responding to tweets from disappointed fans, thatgamecompany explained that localization costs for Europe would be prohibitive. The games themselves aren't the problem; Flow, Flower, and Journey are all wordless and have already been released in Europe on the PlayStation Network. It's the bonus content in the bundle, which includes commentary and other language-specific features, that would increase translation costs. The studio also pointed to logistic costs including advertising, shipping, and dealing with local retailers. 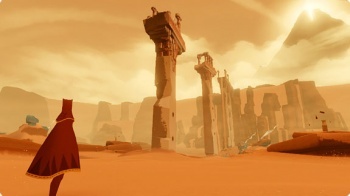 Thatgamecompany is encouraging fans to take it up with the regional branches of Sony Computer Entertainment, which control where the game sees release. Sony's Europe office has not officially confirmed or denied the tweets, simply telling Eurogamer, "release information for other territories will be announced soon." This may mean that Sony is gauging fan reaction versus costs, or simply waiting until the heat has died down. The good news is that Journey: Collector's Edition is region-free, so impatient and underserved gamers can still obtain it by importing from North America or Asia. It's not the best option, and it doesn't cover many European languages, but it may soften the blow if Sony decides to stick to the territories currently planned. In addition, thatgamecompany has indicated that regions denied the boxed bundle may instead get the bonus content via PSN.